Historian Nick Kapur’s fascinating Twitter thread about the BBC’s Advisory Committee On Spoken English and its influence on modern speech reveals just how close we came to referring to anticyclones as “halcyons”, but also offers an illuminating insight into what prescription in language really means. Because of course, there is not one kind of linguistic prescriptivism: there are two. One opposes all language change and all neologism, and attempts to conserve current norms as an eternal standard. But the other seeks to deliberately modify language: not to reject new words, but to invent them, and to influence speech and writing to go in new directions – such as the campaigns to popularise Ms and Mx as neutral honorifics. It is this second kind of prescriptivism, which one might call activist or progressive prescriptivism, that Kapur is tweeting about here. 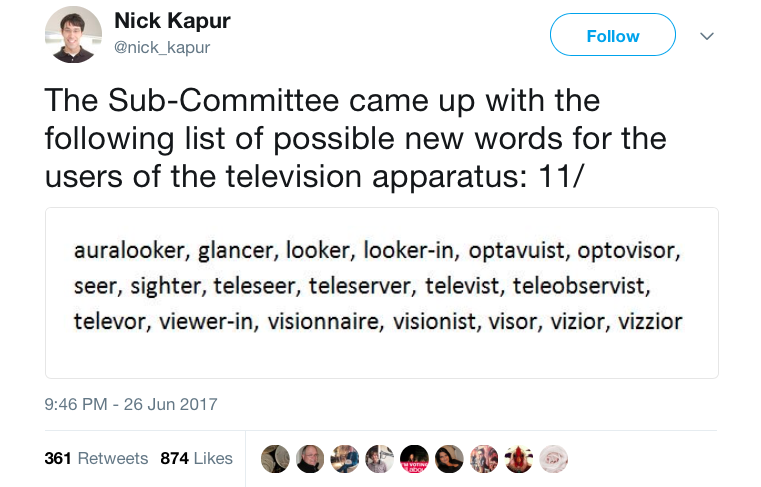 After that, the sub-committee remained active, and widened its remit to mass-produce new words for broadcast far beyond the new industry’s immediate needs, eventually becoming so extravagant and implausible in its inventions that an exasperated chairman of governors closed it down in 1937. But by then it had created several terms – “roundabout” for the road junction, “serviceman” for members of all the armed forces, “art researcher/art historian” to replace the German word “kunstforscher” – that are now commonplace in modern English. The impression descriptivist scholarship frequently gives is that language is an unknowable stew of errors, localisms, homophone confusions and misreadings, prone to unpredictable change. The emphasis, or the cultural preference, often seems to be bestowed on the unwilled variations to language, not the willed ones. But Kapur reminds us that English is also highly susceptible to the approaches of those who have a design on it, from Edwardian grammarians like Fowler to equalities campaigners to spelling reformers like McCormick at the Chicago Tribune. There are words and conventions in many registers of modern English that were created deliberately by people who wanted to see them catch on and took the opportunity to make it happen. Sometimes, of course, prescriptivism is institutional, and benefits from that privilege. It might be justifiably argued that the BBC’s committee, as a quasi-official body proposing usage for the nation’s only broadcaster, was in a very strong position to succeed, particularly as it was inventing terms for then-unnamed phenomena. But the Academie Française, which is attempting to do for French today almost exactly what the BBC committee did for English in the 1930s – and from a similarly state-sanctioned position – is greeted with widespread indifference and derision for its efforts. This is not to say the process is easy: frequently, big innovations just don’t catch on. There is no doubt that some of the committee’s ideas, like some of Fowler’s, are much worse than others: for example, one member apparently felt it desirable to create a shorter term for “inferiority complex” (“inflex”), and another proposed “yulery” as a collective term for Christmas festivities. The point is not that Fowler or the committee were always “right” about what they proposed; the point is – at least sometimes – that they were successful. Usage remains the timeless, and the only, judge of current English. But usage does not simply adjudicate on terms that have risen up unbidden from the demos; it also sits in judgment on peri-statal prescriptions and private linguistic entrepreneurialism. Due process is afforded to all new words, whether they are accidents or designs. Linguists say that language is a democracy, and it is: a democracy in which, among other things, anyone is free to prescribe and see what happens.